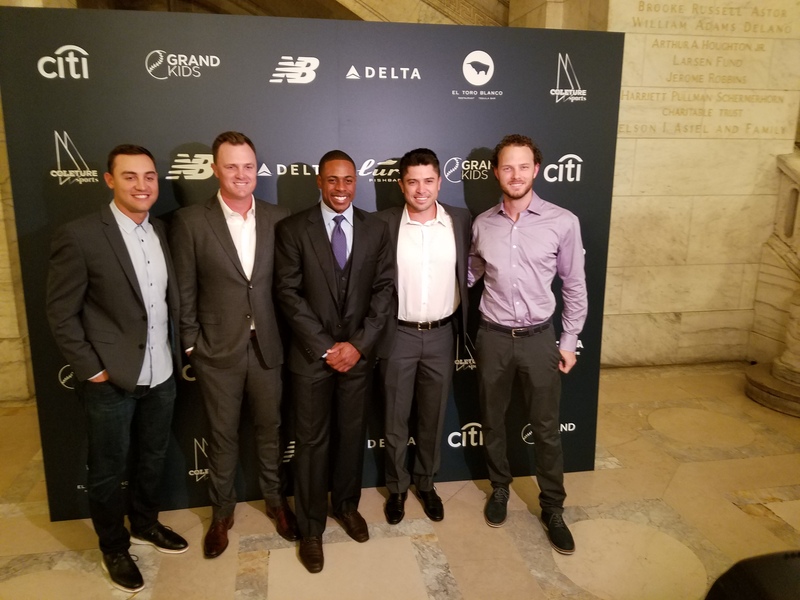 Several of his New York Mets teammates came out to celebrate with Curtis Granderson (center). More than 500 of Curtis Granderson's family, friends, teammates and fans spent Monday (April 7) evening at the New York City Public Library on Fifth Avenue in midtown Manhattan helping Curtis, a New York Mets outfielder, and his Grand Kids Foundation celebrate 10 years of outstanding and inspiring community service. The Grand Kids Foundation, which began in 2007 with an emphasis on education and introducing youth to the great sport of baseball, has evolved into a multi-state charitable organization that aids youth development through a variety of education, physical fitness and nutrition focused programming. “Over the past 10 years we have added all the different elements necessary to help a kid become the best individual they can from an education standpoint,” Curtis told MLBPlayers.com during the event. Today, Curtis and his Foundation reach tens of thousands of kids from New York to his hometown of Chicago, and beyond through programs and events including Grand Giving, the New Balance Fitness Challenge, Citi Community Home Runs, as well as a variety of efforts to support and foster youth baseball across the globe.